Rock Detective Kits contain specimens, each with Mystery Questions for kids to solve and Answer Sheets for teachers. See photos of samples and Teaching Objectives of Mysteries about them. At a "Staff Meeting" described on the Answer Sheet, all students gather to share their ideas and help solve the mysteries. Together, they discover how our planet works. See if you can solve this one? - A handful of fossil shark's teeth. 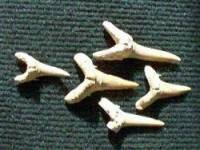 - To introduce fossil shark's teeth. - To get the students thinking about how shark's teeth become fossils. - To show that there was once an ocean over what is now upraised land. - To introduce the concept of sea level change. - We are shark's teeth. - Marine animals were there because there was once an ocean covering the land. - The teeth fell into mud that was at the bottom of an ancient ocean. The ocean was above our heads, and covered land that now is dry. This means that either the land has risen, or sea level has fallen since the shark's teeth mud layer was deposited. - Ask the class what they are. Prompt for shark's teeth. Ask where the teeth came from. Let the students conclude that they were shed from sharks swimming in an ancient ocean. Note for them that the teeth fell into mud which eventually turned into soft rock. - Note for the students that the teeth were collected from a layer high on cliffs along the ocean and show them the drawing on the Question Sheet. Ask them how the teeth got up above the modern sea level. Remind them that the teeth were shed from sharks that lived in an ocean. To help get the point across: Stand next to a wall, pretend that the floor is at today's sea level, and then reach up and note that the sharks teeth came from a layer above your head. Again ask how the ocean got up there above sea level today. The kids will soon 'discover' that either the land rose, or the ocean level went down.